Courtesy of our friends at TechRadar, we've got another hand-picked selection of tech news for you today: find out about Samsung's upcoming foldable Galaxy X phone, a detailed new 007 set from Lego, a premium compact camera from Fujifilm, and more. When will the Galaxy X appear? Rumours of a foldable Samsung Galaxy X phone have been swirling for as long as we can remember, but it seems that the flexible handset is finally going to see the light of day next year. Sources speaking to the Wall Street Journal say the device, codenamed "Winner", will be the size of a small tablet when laid out flat, and fit in your pocket when folded up. 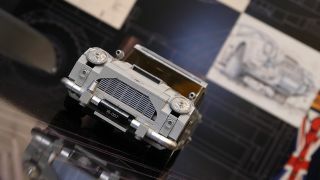 After Harry Potter, Star Wars, Jurassic World and the rest, Lego is turning its attention to James Bond – the building block company has announced a new 1,295-piece set that recreates the iconic Aston Martin DB5 car seen in the 1964 flick Goldfinger. As in the film, the car has revolving number plates, fitted machine guns, and a working ejector seat. Tend to smash your phone screen a lot? Corning's new Gorilla Glass 6 technology might just save you, as it can withstand an average of 15 drops from over a metre without breaking. The technology is being made available to manufacturers now, so we should see it appearing in phones from Samsung, Apple and others over the next few months. If you're looking for a new digital camera to take on your summer travels then you could do a lot worse than the new XF10 from Fujifilm, yours for £449 or $499.95 in August. It features a 24.2MP APS-C sensor, an expanded 100-51,200 ISO range, and a 3.0-inch touchscreen. For the Instagram fans out there, it also features a Square Mode you can use. LG has already launched its fair share of flagship phones this year, but it's not finished yet. According to sources in Asia, the company is set to push out the LG V40 ThinQ, maybe its most advanced phone of the year, in October – head-to-head against the next iPhone. One of the rumours about the phone is it'll feature a total of five cameras, front and back.